Did you purchase a home in Seattle that was made during the years of 1995 to 2007? If so, there is a good chance your home was made with kitec plumbing. You could be facing big problems in the near future from leaking pipes and fittings causing extensive water damage to your home. Kitec plumbing is a flexible aluminum pipe between an inner and outer layer of plastic pipe with brass fittings. 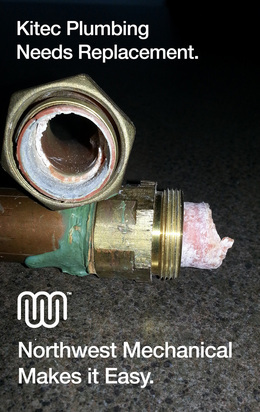 Originally, this was supposed to be a cheaper alternative and easy-to-install alternative to copper piping, for potable water, in-floor, and hot-water baseboard heating systems. The good news is that if you are one of the 10,000 homes in the Northwest affected, there is a class action settlement against Kitec. This settlement gives families like yours the money to replace their plumbing system with a new reliable piping system. Our plumbing experts at NW Mechanical can help you solve this problem and install an affordable and reliable new system for your home. Our expert plumbers can install a heat exchanger, or upgrade your home’s plumbing to a boiler system to separate the potable water from the heating water. We have professionally replaced over 150 failing Kitec systems in the Seattle area with new PEX tubing, a system that solves the issue of bacterial growth and water contamination. The only reliable way to solve the risk of water damage in your home is to re-pipe the Kitec with new piping. This is an extensive re-piping, which includes sheetrock repair, but in the end, will save you from major damage and cost. Our staff will coordinate the whole job for a guaranteed, “better than new”, worry-free replacement. We want to help you avoid imminent water damage caused by a faulty Kitec system and help you take advantage of money due to you to replace and upgrade your heating system. Northwest Mechanical is an expert in solving this problem and is offering excellent pricing on Kitec replacement as well as coordinating every aspect of the job including sheetrock repair, painting and Kitec settlement documentation. Let us help you solve this problem and give you some peace of mind. Contact us for more information or to schedule a free appointment.